Menachem and I both recently referred to a term that R' Lichtenstein invented at the end of this letter to the Forward- the Procrustean Sarcophagus. Typical of RAL, it's brilliant, terse, and very obscure. The Hebrew equivalent would probably be kever Sedom or aron Sedom (though I'd advocate tachrichei Sedom), none of which are as obscure as RAL's term. If you didn't catch the typo, reread the post title. It baffled me at first, but I figured it out relatively quickly. This letter appeared when I was studying at Machon Gruss, YU's Kollel in Jerusalem. Gruss always has an interesting chevre, and my year there was no different. There were all sorts. Especially prominent, however, was a group of what would be called 'YU Yeshivish' guiys. MO backgrounds, but somewhat enamored of yeshivish trappings, ideas, and attitudes. At Gruss, this group experiences a sort of repeat of Shana Aleph, but I digress. Interestingly, RAL is the nominal Rosh Kollel of Gruss, giving 2 weekly shiurim, one Gemara and one Hashkafa, and having a presence in various other ways. The Rosh Kollel in practice, R' David Miller, is a very close disciple of RAL. Since RAL is so difficult to understand on so many levels, and since the hareidi establishment views him as something of a misguided genius, many of the fellows never bother to attend RAL's shiurim and allow their misunderstandings and presuppositions to rule their opinion of him, even as they learned from one of his closest students. I found it to be very bizarre. 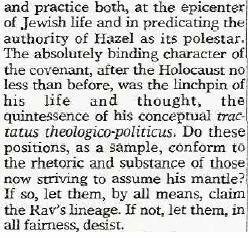 So to prove a point, I went around the Beit Midrash with a copy of that letter, and asked people one very simple question: Who is/was Hazel? Most simply skimmed the paragraph and said "Eh, probably some goyishe philosopher." 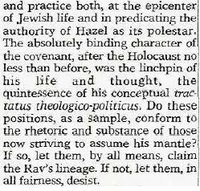 So I pressed further, expressing my amazement that this Hazel dude, whomever he is, is predicated as an authoritative polestar in the Rav's religious philosophy, according to R' Lichtenstein. Some simply didn't seem shocked. It was perfectly plausible for them that some obscure goyishe philosopher would serve as the basis for RAL's philosophy, or that he would see it as the basis for the Rav's philosophy. Others were truly taken aback, and very perturbed by this prospect. Very few caught the typo. After playing games for awhile, I let them in on it. Was it cruel? Probably. Unfair, too. But a lot of fun. And it helped ease my frustration that RAL wasn't being accorded proper respect even in his own kollel. If you still haven't gotten it, Hazel is supposed to be Hazal (as in, Chaza"l). Makes much more sense that way, no?